I think this interview above should be read side-by-side with this Digiday interview with S4 Capital and former WPP CEO Sir Martin Sorrell. Accenture Interactive had a well-covered showcase last month at SXSW, and this interview with Anatoly Roytman – the managing director and Europe, Africa, and Latin America lead at Accenture Interactive – breaks down how they built the “experience architects” value proposition. 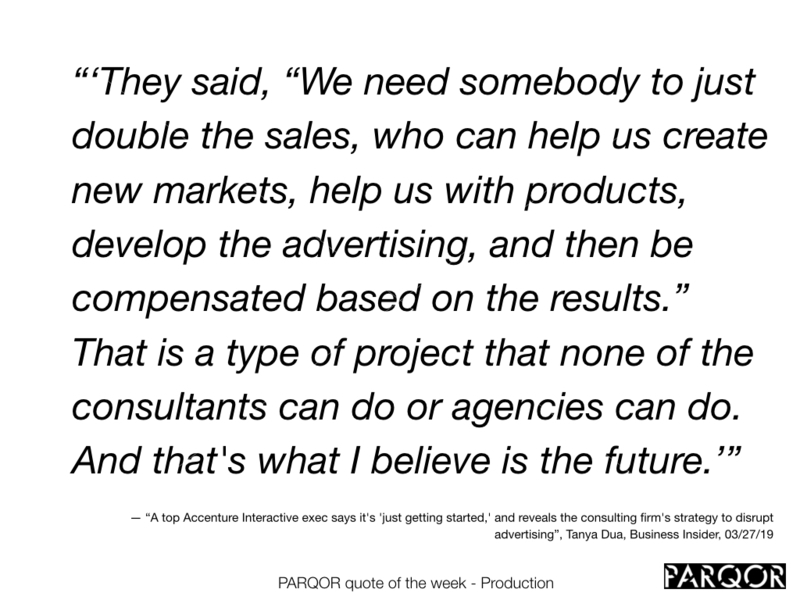 Also, compare the success of Accenture Interactive’s “experience architects” approach to the success S4 agencies have found with a “purely digital”, data-centric approach to selling CMOs. Sign up for the weekly PARQOR Newsletter here! Listen to RevThink founder Tim interview Andrew here.